Dial Hand Soap only $0.54 each w/ Coupons! 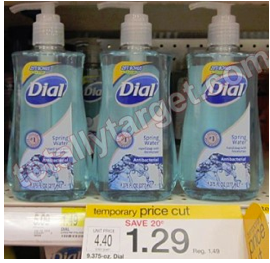 You can get a great deal on Dial hand soap at Target right now! = $2.16 for all 4 or $0.54 each! NOTE: Some stores allow you to use 2 Target coupons in one transaction. If yours does, you'll get an even better deal!